The Hart of the Munchkin Patch: Secret Santa Solutions by 3M, Scotch and Post-it! Hunting for the perfect 'Secret Santa' solution for a stylish colleague or maybe your looking for the ideal stocking filler for the fashionista that 'has it all' ...? Look no further than these unique Scotch and Post-it Brand gifts from 3M. If your Christmas budget doesn't quite stretch to a pair of coveted Louboutins or that Mulberry handbag, fear not for you can still be on trend this Christmas with these two leading stationary brands. 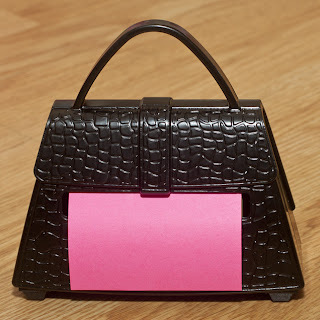 The Pop-up Note Dispenser takes the form of a trendy mock-croc style handbag. The stylish, refillable Post-it Note Dispenser is wonderful for personalising any desk space. This item is so elegant and stylish as well as being compact, meaning it can sit on the smallest of workspaces, ensuring that your handy Post-it Notes are always at your fingertips. This classy, chic dispenser is weighted which means it stays put, making it even easier to use, even with just one hand. This fashionable item is simple to refill as the dispenser pops open with the press of a button and takes 76mmx76mm Post-it Notes. The pack contains one pad containing 50 sheets of pop-up Z-Notes, and additional refills can be found on the 3M website. I have found my Post-it Note Dispenser so useful and it is now a permanent fixture on the work desk at home! Next is the sassy, sharp Scotch Tape Dispenser. If shoes are the accessory of choice for the fashionista in your life, then this unique, Stiletto Shaped Scotch Tape Dispenser would make a great gift. Again, this item is also weighted, making it easy to use, even with only one hand available! This a fun and functional tape dispenser which will look great on any desk top whether at home or in the office. I comes ready to use, complete with a 19mm x 8.89m roll of Scotch Magic Tape. This great tape is ideal for so many uses, as it is invisible once stuck down, making your gifts or creative projects look exceptionally neat! Additional rolls can be purchased HERE. The heel of the stylish stiletto is attached to a plastic disc which ensures that the item stays steady on your desk and remains balanced. Both of these products are stylish, practical and fully functional desk accessories and are perfect for dressing up any desk. As both of these office essentials are under £10, they make wonderful stocking fillers or Secret Santa gifts for the fashion fan in your life! "3M captures the spark of new ideas and transforms them into thousands of ingenious products. It's culture of creative collaboration inspires a never-ending stream of powerful technologies that make life better."